Moored outside the Sea Scouts building is an old Dutch barge. 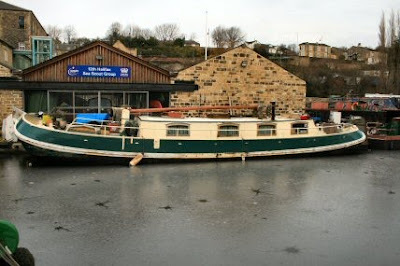 According to Jim Sheads website it is called Jaconise and is 51 foot by 11.5. Doing a Google turns up just four entries and one of those is Jims so I have no further data on it. 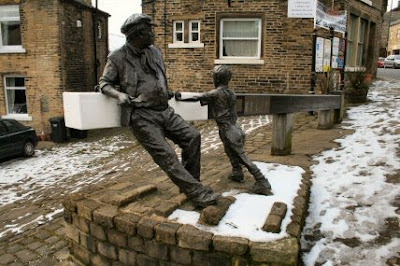 At the entrance to the basin is a delightful statue of a couple opening the lock gates. Called something like Jack o' the Lock it makes a nice seat in fine weather but not today. 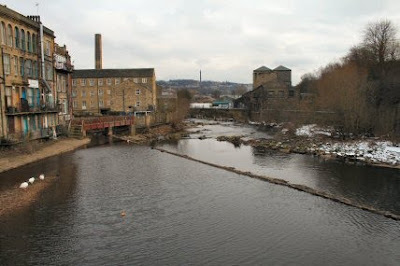 At the end of the main street through Sowerby Bridge is the River Calder. It looks as this is well used too with a slalom canoe course laid out. Too damned cold today for it to be used. Still no swans. The three birds on the left are geese. Walking up the hill a view back down the valley. 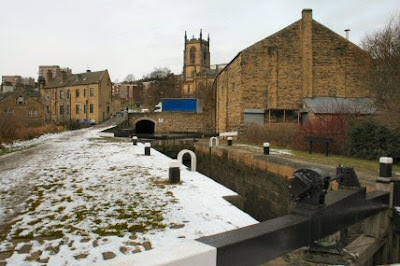 There are glimpses of the canal in several places as it snakes its way down to Salterhebble. 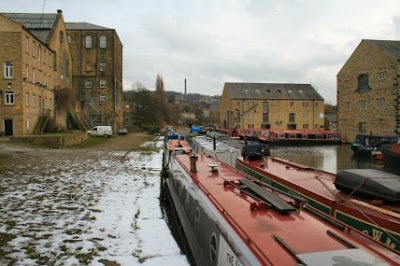 The building left of centre is the Navigation and Abigail Jenna is moored just to the right. 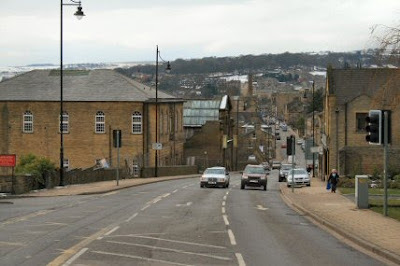 The tower that stands out the most in Sowerby was built in 1875 for a dyeworks but was never used. 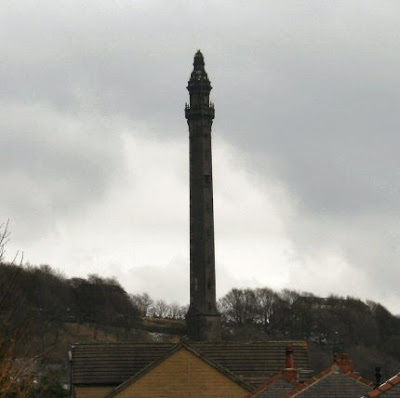 At 253 foot high the Wainhouse Tower is now used as a viewing tower and (according to the book) is open on Bank holidays. 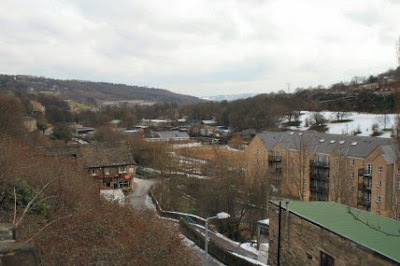 The main road down through Sowerby Bridge and, what has been christened Cardiac Hill, the route up from the canal is on the left. Another decent pub is the Shepherds Rest. There were 9 real ales and the pub is that good there is one named after it. 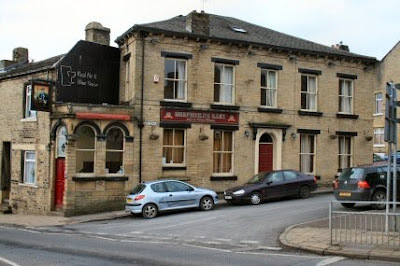 Ossett brewery seems to be the main one here. Very chatty bar people and the locals are the same. 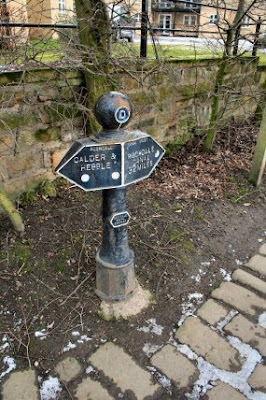 Had a long chat with someone in the Calder & Hebble Canal Society.